the yellow perch, grace the plates of Northern Ohioans all summer long. 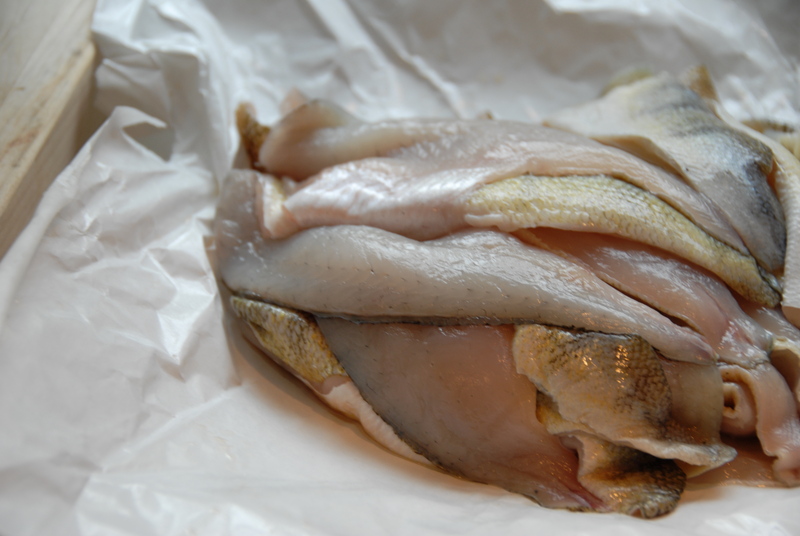 Lake Erie perch is a mild, flakey white fish that fries up remarkably well. Pair it with some homemade tartar sauce and a cold Great Lakes brew and you’ve got good Cleveland eatin’. 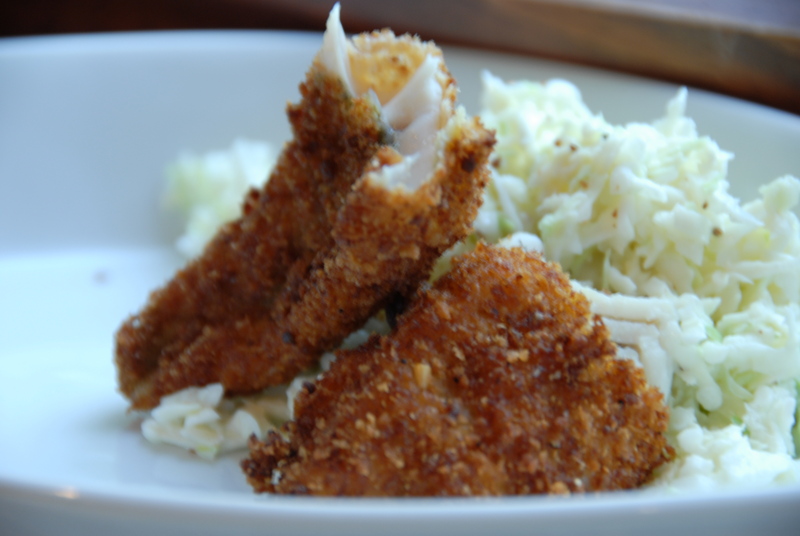 Fried perch is quite simple to prepare but then again, I also had my brother for a sous chef – an experienced perch fryer, thank goodness. Start by patting dry the fish filets and setting up a dredging station. First the seasoned flour, next, the beaten eggs, and finally the breadcrumbs. Heat the oil in a heavy pot, a dutch oven works well here. You’ll want the oil to reach a temperature of 350° or higher before beginning to fry. *Tip: if you’re using a candy thermometer, be sure to watch it carefully. Before I knew it my oil had reached a temperature well beyond 400° and as I reached over to grab the thermometer off the edge of the pot I heard a POP! and watched as the red mercury oozed out of the broken thermometer and into my oil – therefore sending my brother to the store yet again to purchase more oil. It’s best just to monitor the hot oil and when you see it swirling about test a tiny strip of the fish and see how it cooks up. If it’s bubbling like crazy and cooks up quickly, you’re in business. Here’s the fish frying process. Step 1. 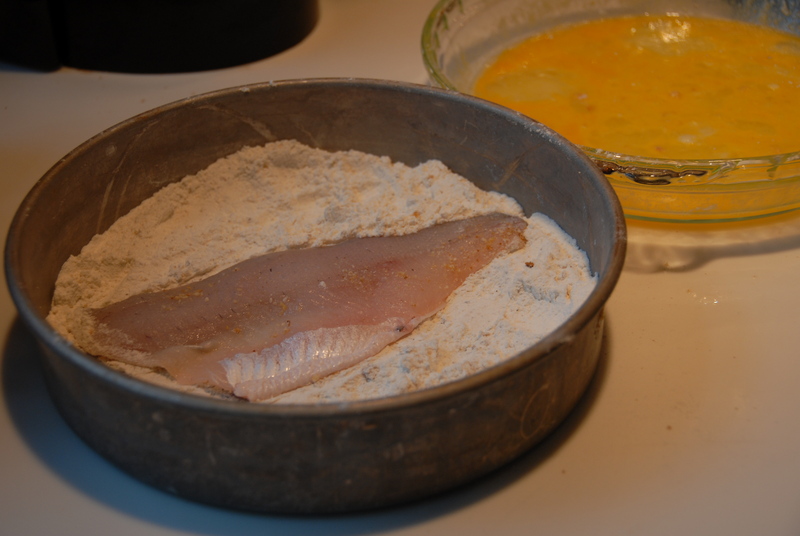 Dip filet in the flour until it’s nicely coated on both sides. Shake off the excess. Step 2. Dip filet in eggs, coating both sides. Shake off excess. Step 3. 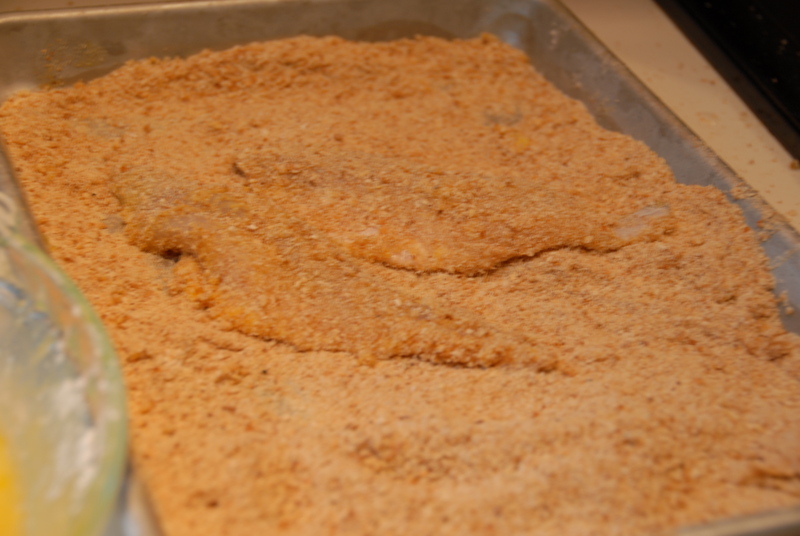 Dip the filet in the breadcrumbs, coating both sides. Shake off excess crumbs and gently lower about 3 strips of perch into the hot oil (or as many that will loosely fit in your pot). They will cook up in 3-5 minutes depending on the size of the filet. Once the filets come out of the oil place them on paper towels to drain and cool. I served these filets with classic coleslaw and oven fries. Nothin’ fancy but quite delicious. I’d like to share with you all that this is my last entry from the Cleveland area. I’m spending the rest of the day packing, (my absolute least favorite thing to do) for tomorrow I head to New York. It’s been lovely to be able to share these past few months worth of meals with my family here in the Cleve. Now they’ll just have to do what most of our readers do – drool from afar. This entry was posted in City Classics and tagged Cleveland, coleslaw, fish, fried perch, Great Lakes Beer, Lake Erie, oil, tartar sauce, Yellow Perch. Bookmark the permalink. You made me remember that I have to take out the walleye filets from my 29 1/2 inch Lake Erie catch in October. Thank you and I will fix them exactly like I would perch.